Welcome to Physics of Out-of-Equilibrium Systems! Among matter and phenomena we see, those at thermal equilibrium or close to it are deeply understood, thanks to the celebrated thermodynamics and statistical physics. Those are powerful and unified frameworks to describe such equilibrium systems. However, when we turn our eyes to natural phenomena around us, we realize that many of them are actually not at equilibrium. To give some examples, water and air produce large-scale convection over the globe. Our sky and landscape are showing beautiful patterns to us. How about life? Animals, plants and microbes constitute ecosystems, move and gather collectively, and live their lives with many kinds of activity. In our body, too, various biomolecules interplay cooperatively to maintain life. What is life at all? Once you get interested to understand such phenomena driven out of equilibrium, we need to step forward from the realm of the equilibrium thermodynamics and statistical physics. Are there laws and concepts of physics ruling systems out of equilibrium? Are there universal frameworks? We, in the field of out-of-equilibrium physics, aim to explore such a frontier. In Takeuchi Lab, we aim to explore laws of physics underlying out-of-equilibrium phenomena, by pushing forward research subjects encompassing soft matter such as liquid crystal and granular systems, fluids, and biological populations, mostly by experiments. In addition to understanding specific problems, we aim to extract laws of physics that are hopefully common across different systems and phenomena. As a result, there are a relatively wide range of subjects ongoing in the lab. Currently, our main subjects are "exploration of universal out-of-equilibrium scaling laws using liquid-crystal turbulence" and "search for physical principles governing populations of living cells by means of microfluidic devices", but we also continue being motivated to launch "new projects that are interesting and realistic to challenge". In case nothing is shown, it may be due to tracking protection of the browser, which is known to block embedded Twitter widget in some conditions. The inner part of the logo represents the Schlieren pattern of topological defects of liquid crystal (real image), whereas the outer edge shows KPZ-class interface fluctuations, which we discovered in the topological-defect turbulence of liquid crystal (learn more). 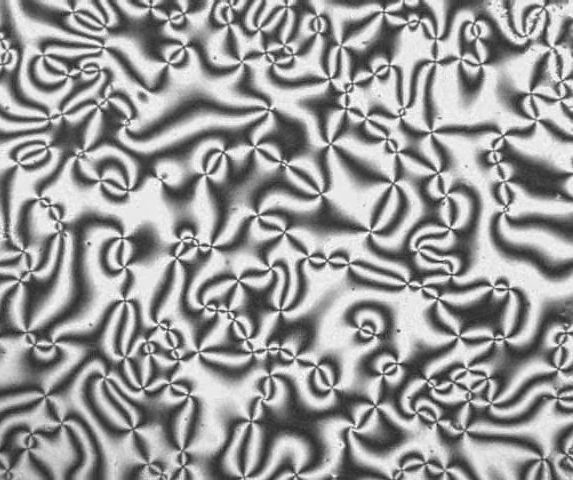 By depicting smooth Schlieren patterns of individual defects and a fluctuating KPZ interface made of a collection of defects in the single figure, the logo represents our scientific interests in linking microscopic and macroscopic phenomena, as well as deterministic and stochastic problems. Moreover, the intertwined red and blue curves are symbols of our approach incorporating both experimental and theoretical studies.